Would you like to have a garden with bright color for months and months, but your soil is poor, your winters cold, and you don’t really have much time available? If that sounds like you, then the Barberry is your friend. 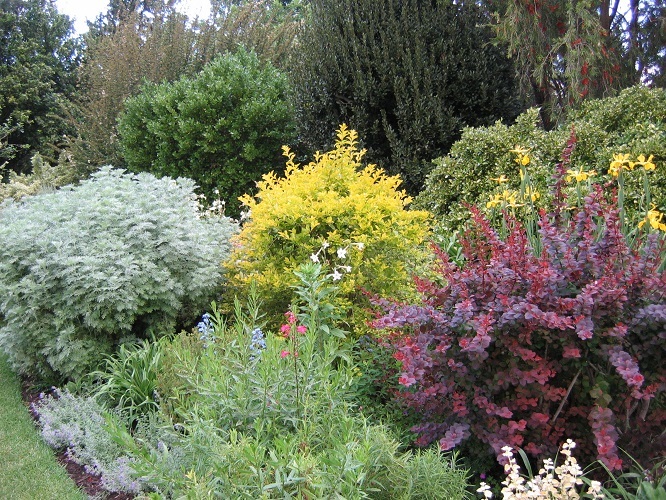 These tough shrubs grow well even in zone 4, they are resistant to dryness, they cope well with poor soils, and they are colorful from spring to fall, never turning into boring green after a few days once a year of flowers. Few shrubs have such a wide range of leaf colors, from the every-popular purple-reds to the fashionable lime greens, with golds, yellows and oranges in between, you could easily create a whole landscape of color with just this one plant. Available too in a range of sizes, from hardly more than a foot tall to a substantial 6 feet, there are lots of places where you could slip them into your existing landscape. Did we mention hedges? 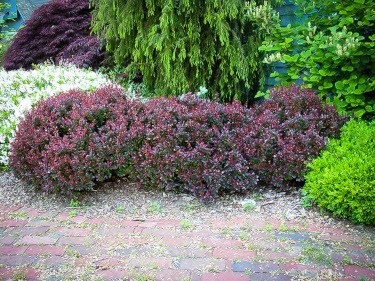 Yes, there too, as a low bed edging, or a taller barrier, Barberry clips easily into great, colorful hedges. Some gardeners can be put off Barberry because there are sharp little thorns along the branches, but this has a very positive upside. Planted beneath windows they make it a whole lot harder for an intruder to climb in – unless they are wearing cowboy chaps – and a Barberry hedge is an easy way to keep four-legged intruders out of your garden. It takes a brave cat or dog to push through Barberry just for the opportunity to dig around in your beds. And of course, if you have deer, they won’t be munching on those spiny stems either, so not much touches this plant at all. If you are looking at a boring green garden, with little or no color through the seasons, an easy way to tackle it would be to order in a batch of Barberry, in a variety of colors and sizes. Stand back to get a good view and then slip them in here or there around the garden, creating splashes of season-long color in just a few minutes. Once planted there is little more to do than watch them grow, and see your garden come alive. The Barberry, or as botanist call it, Berberis, is a large group of shrubs, but for our gardens we rely almost completely on one brought into America by plant collectors from the Arnold Arboretum, in the 19th century. Back then there were few garden plants, and this new shrub, with yellow spring flowers, red fall leaves, and red berries in winter, soon became a big hit, and it was widely planted. That Japanese Barberry, Berberis thunbergii, had a lot of tricks up its sleeve, and since the first introduction that green plant has been transformed. Within a few decades French growers had found seedlings with rich purple-red leaves, and then the Dutch – as we might expect from such a small country – found dwarf forms too. In later years a whole palette of color exploded, until we have today’s bounty of shades. Hardy in winters to minus 30, and easily grown in any soil that isn’t always swampy, all these shrubs ask for is a sunny spot to put down roots in. They will also take light shade for a few hours of the day, but too much shade will ‘green out’ the foliage color, which would be a shame. Here is a quick guide to some of the best varieties of Barberry, in different colors. Ground zero for dark red leaves – always a top favorite with gardeners – are plants derived from those early French seedlings. These are often called ‘f. atropurpurea’ (where the ‘f’. designates a form that is different from the parent), but that rather tall and leggy original is rarely grown anymore. Much more useful are smaller forms, such as ‘Concord’, which reaches no more than 2 feet tall, with a similar spread. That fat form makes hedges more economical, as you can space the plants as much as 18 inches apart and still quickly create a dense but low hedge. A similar spacing is perfect for mass planting, which fills larger sections of your beds quickly and easily. Despite its name, ‘Crimson Pygmy’ is taller, growing to 2 to 3 feet tall, and as much as 4 feet across, with the same rich, all-season purple-red leaves. It’s a perfect choice for a slightly larger hedge, or further back in a bed, behind flowers. If you have some concerns about Barberry spreading into local natural areas – which it has done in some parts of the country – then you can still enjoy them by planting the Royal Burgundy® Barberry, which produces no berries, so cannot be spread around by birds. It is similar in size to ‘Crimson Pygmy’, with an attractive arching form when left untrimmed. To add to the beauty, the dark leaves of these bushes turn rich oranges and scarlet-reds in fall, making a great showing, before dropping in time for winter. If the same color all season is a little boring to you, then the ‘Rose Glow’ barberry is for you. Starting out purple in spring, the new growth is rose-pink, mottled with bronze and purple. As the leaves mature they darken, so that the shrub has a bright, rosy exterior, with a deeper purple interior, which really brings the colors to life. A taller shrub if left unpruned, it can touch 6 feet, so it is perfect for background planting in smaller beds, and middle-ground in larger ones. If you love orange, then bring it to your garden with ‘Orange Rocket’. 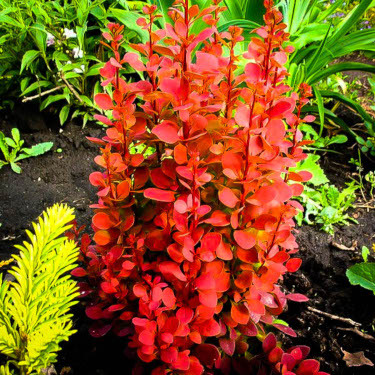 This unique Barberry starts the year with an explosion of rich orange foliage. The color holds well into summer, then turns light green, before a vibrant encore of brilliant ruby-red in fall. This is truly a hard-to-beat source of rich colors season after season. 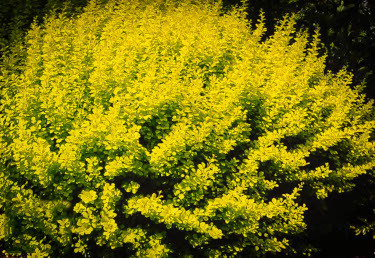 While reds are always popular, smart gardeners use plenty of yellow foliage, while those up with garden fashions opt for lime-yellow. These colors really ‘pop’ in the garden and bring lots of life and color to your beds. ‘Aurea Nana’ is just that – a small bundle of vibrant golden leaves that hold their color from spring to fall – no summer fading into green with this beauty. 2 to 3 feet tall and wide, it is perfect for a low edging to a bed, or as specimens in smaller gardens. They are also ideal for planters, surrounded perhaps by blue and silver trailing annuals – a great display. For a more upright form, choose ‘Golden Rocket’, which stays just a foot or two wide but it stand up proud 3, 4 and as much as 5 feet tall. It too holds that color from spring to fall, and it is ideal for building height in small beds. For that perfect low edging, that keeps changing color in every season, plant the tiny barberry, ‘Daybreak’, which starts orange-red in spring, turns yellow all summer and then bright red in fall. It only grows 18 inches tall, so even left unclipped it is perfect along a driveway or fronting a bed. Then, for the perfect lime-green accent, plant ‘Lime Glow’, with yellow new leaves that quickly turn the perfect bright lime, looking wonderful across the garden. It grows into a substantial 5-feet tall and 4-feet wide shrub, and makes a wonderful hedge along a boundary, that is both beautiful and impenetrable. With all this to choose from, the simple solution is to plant a wide selection of these great plants – tough and colorful, and oh so easy to grow.